This morning, Little Scampy has an appointment at AJ's Auto Service in Salem. Our replacement grey water tank is to be installed. You may recall that, sometime back, Scampy's grey water tank got crushed. We don't know how that happened. We saw some things hanging down underneath. And there it was! We ordered the replacement grey water tank from the manufacturer in Canada. That tank was received on September 5th. But tank installation has been hanging fire since then for need of a plumbing fitting. 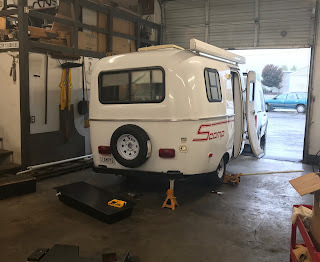 We bought that fitting from Scamp Trailer. The fitting serves to connect the grey tube to the tank. The first fitting got lost in transit. So we had to order another. 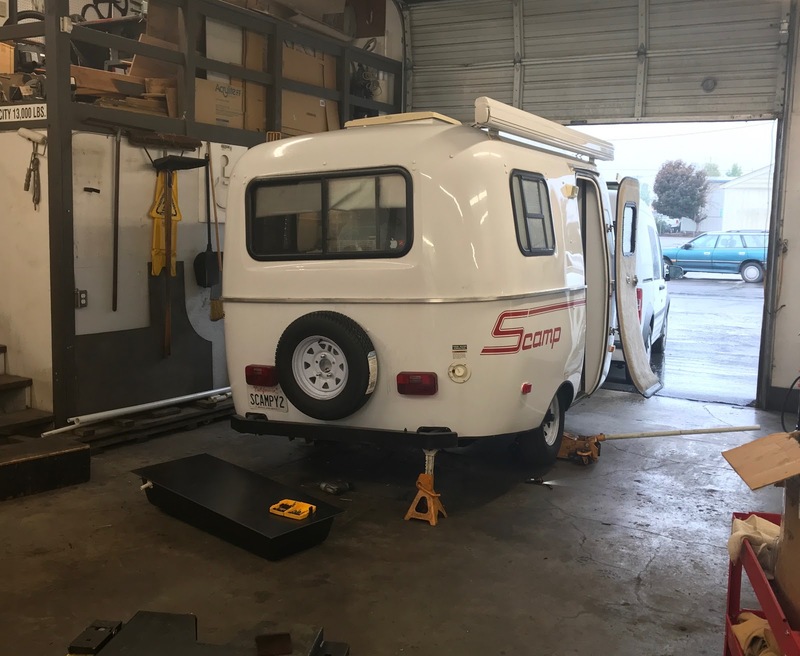 No company in the RV repair business had time for Scampy's repair. And no company in auto service wanted to deal with an RV. We found AJ's Auto Service when we wished to have Scampy's brakes checked. l believe that AJ's Auto Service is a one-in-million company! AJ's is sooooo sensitive to doing good. And being polite! The Scampy Team is very happy about being at AJ's today! Looking online for a breakfast joint, we found Patty's place. It's busy here. We are sitting at the counter. 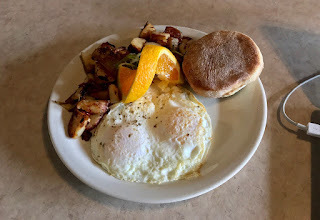 2-eggs over easy, country potatoes, English muffin! Of course, black coffee. ➜ AJ's completed the grey tank install. There was a huge glitch! Scamp had two incoming grey lines on the top of the tank. ➜ The grey water dump valve now needed installation. But! There was no fitting for connecting the flexible hose to that dump valve! We went to Roberson to buy that missing fitting. Thankfully, Cory, Roberson's parts manager, climbed under Scampy numerous times in order to analyze what needed to be done and educate me as well.! We have sooooo much praise for Roberson's Cory! A great guy!! ➜ Lowe's. We are here to buy ABS cement. I do not want to install the grey valve and associated fittings myself. I know what to do. But at my age, going underneath Scampy and working on my back is not easy as it was when was younger. I probably will NOT do it myself! We are heading west in order to reach Lincoln City. But old George got sleepy. According to our deal, made with our own self, we have pulled off the highway to rest in the little Town of Rickreall. We'd like to stay the nite here. 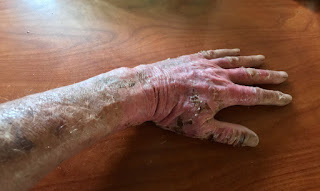 I just completed changing my burn wound dressing. Little iPhone took a pic for you to see. I learned a lot about wound care from yesterday's disaster. I was a wound care imbecile! When my burn had pretty much healed, I figured that I was now able to resume my normal life. This was NOT correct because the burned tissue was still exposed. Burned tissue does NOT have resistance to bacteria. This means that absolute cleanliness is essential for the burned skin. Keeping the dressing secure and dry is the only way to prevent bacteria from entering my body! This evening on PBS Newshour, there was a story about OxyContin. This news report addressed the State of Washington's law suits against Perdue Pharma, maker of OxyContin. Since my pain control drug is OxyCodone, I was curious. Because OxyContin and OxyCodone are such similar words. OxyCodone is an opiate but may be combined with ibuprofen or Tylenol in some formulations. A number of prescription pain relievers including Percocet, Percodan, Tylox andOxyContin all contain oxycodone. However, oxycodone is the only ingredient in the stronger version of the drug:OxyContin. My med, OxyCodone is stronger than OcyContin!! 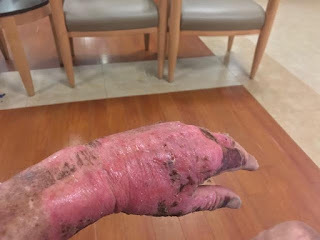 George, just got caught up on your burn, injury, and infection.... Whew, glad you got treatment. I got real lucky in that propane explosion. I could easy have been killed. Or wound up in a burn ward with terrible pain for years!! I'm glad you found a honest person to deal with that really cares about you and your rig. They're hard to find! Good luck on the repairs! I will be following the same process in the next month or so, as soon a my slide is fixed :( I have a grey water leak. Yes! Glen, owner/partner of AJ's is a fantastic fellow. Well you are making progress, hope you get things all fixed up soon. "...... hope you get things all fixed up soon"
as in the grey water tank? Yup that and anything else that needs fixing. "...anything else...." may take longer! Yes! It came from my using an incorrect quick disconnect valve. Even now, the connection to our catalytic heater is not correct. We will be making it 100% correct. Glad to hear your infection and burns are on the mend. So happy your hand looks 100% better! Glad too you pulled over when you did at Rickreall! We care for you, sir! Geez, I'm so sorry Silvadene didn't work for you.. I had a similar burn on my hand from bacon grease and a stupid me, and a frying pan..I was healed in days..
Silvadene is only a medication. Not a wonder cure. My present treatment is working fine, as you may see for yourself from my Today and Yesterday pics. Thanks for being concerned, David! David, also remember, George's burns are second degree burns which mean two layers of skin were damaged and need more careful treatment. Somehow, I did not pickup that info! However, I know about wound care now. This morning, I have no pain from my burns! Thank you sooooo much for remembering David. Remembering keeps him alive for me. George, I have been following you since you first started your blogs. If anything has been consistent over the years it is your resilience. Keep on keeping on. Oycontin is a time release formula of oxycodone.